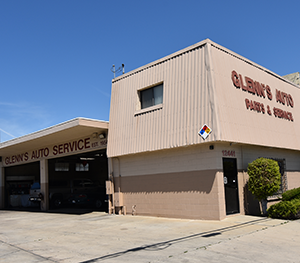 At Glenn’s Auto Service in Downey, CA, we believe in quality auto repair at affordable prices. Our shop has been in business since 1954, and has been family-owned and operated and run by a husband and wife team since 2004. Mike Grosse, the current shop owner, has been part of the auto repair industry for over 30 years. His professional background began in vehicle maintenance, computer diagnostics, and emissions testing for vehicles. He has always enjoyed working with his hands and dealing with new challenges every day, which is why he chose auto repair as a profession. His hobbies outside of auto repair include camping, fishing, and off-roading. Glenn’s Auto Service’s staff consists of highly-trained technicians. Once you have experienced our top notch customer service and unmatched automotive repair skills, you won’t trust your vehicle with anyone else! Our shop’s associations include ASCCA, WTI Smart Group, and ASE. At our Downey auto repair shop, our goals include providing excellent customer service, becoming the trusted choice among the community, being an affordable option for all, and employing the most qualified technicians available. We aim to be the best go-to shop in town. We treat all of our customers like family and take the time to listen to their concerns. Stop in and meet our team that is as talented as they are friendly. We love what we do, and what we do is meet and surpass the expectations of our customers. Our reputation precedes us, and the public has spoken. Give us a call or request an appointment today!